Titan’s VIP door-to-door travel service collects you from home for your flight to Calgary. On arrival in Calgary we transfer to Banff and our hotel, the Banff Caribou Lodge (3T+) or Ptarmigan Inn (3T+). This evening you are free to enjoy the hotel facilities and the choice of local eating places. 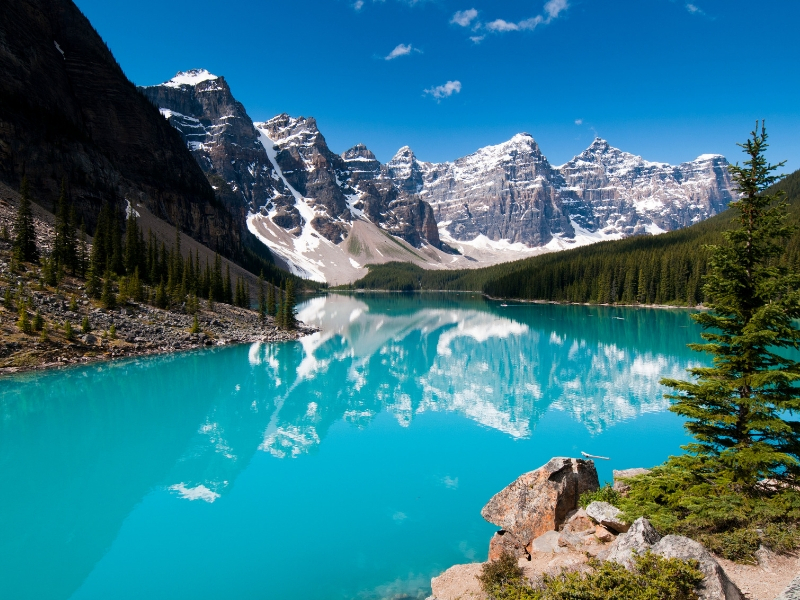 Today we tour the surrounds of Banff and its lakes, which includes Moraine Lake and Lake Louise. Returning to Banff and our hotel, we are free this evening to discover some of the town’s nightlife. Today we are at leisure in one of the loveliest small towns in North America. On the outskirts of town is Sulphur Mountain, with its enclosed gondola ride to the 7,500ft summit from where there are some breathtaking views of the Bow Valley and Banff town below. This morning we take the Icefields Parkway from Banff National Park to Jasper National Park. This stunningly scenic road links these two great parks, and for over 140 miles takes us through jagged mountain peaks and high forested valleys, passing emerald lakes and mountain-fed streams, waterfalls and rivers. The halfway point is the spectacular Columbia Icefield, one of the biggest accumulations of ice and snow south of the Arctic Circle. Here we take an included Ice Explorer ride on to the surface of the Athabasca Glacier (subject to favourable weather conditions). Turning west, we enter Jasper National Park – 4,200 square miles of alpine forests, natural hot springs, white-water rivers, tranquil valleys and jagged snow-capped mountains. Our hotel for the next two nights is the Lobstick Lodge (3T). This morning we are free to relax in Jasper. In the afternoon we board our coach for an unforgettable sightseeing journey that begins with the limestone gorge of Maligne Canyon and continues along the shore of Medicine Lake on to the breathtaking Maligne Lake, the largest of the glacier-fed lakes in the Rockies and the second largest in the world. This evening we enjoy an included dinner with an interpretative talk. A spectacular drive this morning as we leave the Rocky Mountains and descend to the lakes of the Okanagan Valley and our next destination, Kelowna. Our hotel tonight is the well-appointed Best Western Plus Kelowna Hotel & Suites (3T+). Leaving Kelowna behind this morning, we take the twisting scenic valley route to Hope. We continue on our drive south through Vancouver to Tsawwassen, to take the ferry through the glorious Gulf Islands region with towering Douglas fir trees climbing the hills on all sides, to Swartz Bay. We continue to the southern-most tip of Vancouver Island and Victoria, the provincial capital of British Columbia, and our hotel – the Chateau Victoria (4T) or Embassy Inn (3T). This morning we have included a short city tour of Victoria before a visit to the world-famous Butchart Gardens. Returning to Victoria, our afternoon is free to explore this charming city. The evening offers another chance to sample the range of fine restaurants. A further day in this enchanting city for you to relax and explore at leisure. Leaving Victoria behind this morning, we drive to Nanaimo, a deep sea fishing port and major centre for the forest industry, where we take the spectacular ferry crossing through the Strait of Georgia to Horseshoe Bay. A feeding ground for whales, dolphins, sea lions and birds, the Strait of Georgia is a paradise of small islands with beach-front houses and towering fir trees, some as much as 600 years old. We dock at Horseshoe Bay, and continue on our journey to central Vancouver and our hotel, the Pinnacle Vancouver Harbourfront (4T) or The Metropolitan (4T). Vancouver is considered by many to have one of the most spectacular settings in the world – in the foreground the encircling Pacific Ocean and, as a backdrop, the grandeur of Grouse Mountain. For natural beauty, there is the 1,000-acre Stanley Park, the largest urban park in North America. It is Vancouver’s green heart – a wilderness area of forest, marshland and beaches. Surrounded by ocean on three sides, the park houses the aquarium and the zoo. For excitement and variety, Chinatown, centred on Pender Street, is a city apart. Vancouver’s 100,000 Chinese are expected soon to surpass San Francisco’s as the largest community outside the Far East. Shops, hotels, markets and restaurants along with incessant activity combine to create a vibrant atmosphere. The Gastown area of the city is distinguished by cobbled walkways, gas lamps, quaint shops and restaurants. As an introduction to this fabulous city we have arranged a short orientation tour; then you are free to discover its wonders for yourself. This afternoon we offer you the opportunity for an optional excursion to Grouse Mountain and Capilano Suspension Bridge. A relaxing free day to further enjoy Vancouver. There are 9,000 marine and freshwater animals at the aquarium in Stanley Park. The Classical Chinese Garden is a replica from the Ming Dynasty and the only one of its kind outside China. You can view the whole panorama from the Harbour Tower, with its observation deck and revolving restaurant. Granville Island, a friendly easy-going and popular spot, is alive with shops, markets, galleries, clubs and a marina. To the west of downtown is Kitsilano Beach which looks out over English Bay towards Stanley Park. Sit outside one of its cafés for an idyllic spot to watch the sun go down.